As a child there are stories that you hear and read that create real places that you travel to, even when you are not reading the books themselves. Places that may or may not exist, but that have found deep places to live in within your heart. As a child, some of these places were only accessible to me through my imagination, as taking fantastic stories and capturing them on film had not yet become fashionable. One of the many lands that I grew up in, perhaps more so than any other, was that of Narnia. My first exposure to Narnia anywhere other than the pages of a book or in my own imagination came with the 1988 BBC miniseries, though I wouldn’t see it until it had come to PBS. I was fascinated by this show because it gave me beavers that were five feet tall, and monsters that I had pictured, shall we say, differently. And yet, I cherished this version, seeking out VHS and DVD copies, because as I grew older it was a window into my childhood fantasies. In 2005, Walden Media and Walt Disney Pictures released the first story of The Chronicles of Narnia, The Lion, The Witch and The Wardrobe. It would be an understatement to say that I waited very impatiently to see a piece of the story I had cherished for so long finally coming to the big screen, the fact that the film premiered the day before my birthday only heightened the experience. Specifically I wanted to see the two pieces I had dreamed about as a child, the wardrobe and the lamppost. For those of you that know me, you know that I am the type to think and feel everything with my heart, so it should come as no surprise that when I saw the wardrobe for the first time there were practically rivers streaming down my face. The storied history of the film’s wardrobe, however, dates back to a time long before Narnia even existed. 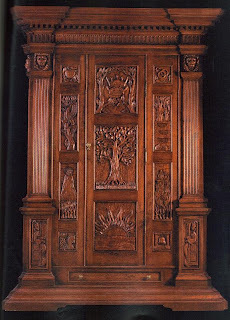 Carved along the front panel of the wardrobe is, in fact, the history of Narnia as told in The Magician’s Nephew. The Magician’s Nephew was C.S. Lewis’ explanation of the world of Narnia, a prequel to The Lion, The Witch and the Wardrobe, and was released as the sixth book of the seven Narnia chronicles (even though it was actually finished after Lewis had completed The Last Battle). The film’s wardrobe highlights many of the key elements found in The Magician’s Nephew: The Rings, The Wood Between the Worlds, Charn, The Golden Bell, The First Sunrise, Fledge (the winged horse), The Garden On Top of the Hill, The Bird in the Tree, The Apple, Two Crowns, and The Apple Tree. I do not wish to give away the story of The Magician’s Nephew, since I highly recommend everyone read it for themselves, but I will say this, the apple tree from The Magician’s Nephew reappears in The Lion, The Witch and the Wardrobe as, you guessed it, the wardrobe, hence its prominent placement on the wardrobe. While The Chronicles of Narnia may have left Walt Disney Pictures, I have been impressed with the first two films, and home the tradition of creating fanciful films from these cherished chronicles continues.